Beginning with an overview of Hume's life and work, Don Garrett introduces in clear and accessible style the central aspects of Hume's thought. These include Hume's lifelong exploration of the human mind; his theories of inductive inference and causation; skepticism and personal identity; moral and political philosophy; aesthetics; and philosophy of religion. The final chapter considers the influence and legacy of Hume's thought today. Throughout, Garrett draws on and explains many of Hume's central works, including his Treatise of Human Nature, Enquiries Concerning Human Understanding, and Dialogues Concerning Natural Religion. Hume is essential reading not only for students of philosophy, but anyone in the humanities and social sciences and beyond seeking an introduction to Hume's thought. 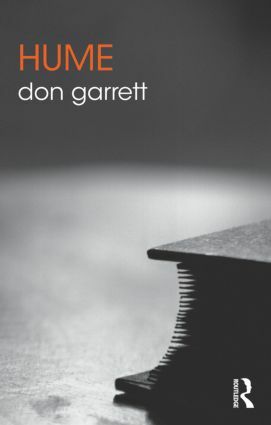 Don Garrett is Silver Professor of Philosophy at New York University, USA. He is the author of Cognition and Commitment in Hume's Philosophy (1997) and the editor of The Cambridge Companion to Spinoza (1996). He has served as co-editor of Hume Studies and as North American editor of Archiv fur Geschichte der Philosophie.